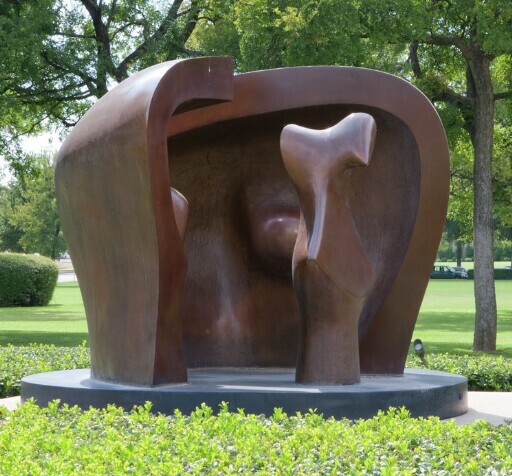 Henry Moore is one of the most important sculptors of the twentieth century. Beginning as a carver in wood and stone, Moore moved to modeling sculpture to be cast in bronze, taking the human form as his constant theme. A major figure in British art, he achieved greatest fame with large-scale commissions for public sculpture in civic spaces and in gardens across the world. Figure in a Shelter is a work from the artist’s last creative phase, produced just three years before his death. Its forms, however, go back to sculptural ideas Moore first explored in the 1930s. The “shelter” that surrounds the figure within has its origins in a helmet-like head that Moore conceived about 1939–40, a shape in turn based on ancient armor. Greatly expanded, the two halves of the “helmet” become an enfolding architectural protection for the small, upright form, whose expanding and contracting columnar shape suggests a human body. Shelter and protection are abiding themes in Moore’s art. Many of his best-known early sculptures show mothers and fathers holding their children. During the air attacks on London during the Second World War, Moore created hundreds of moving sketches and finished drawings of figures sleeping and waiting in underground shelters. Figure in a Shelter, a large-scale bronze that is both ominous and comforting, takes the theme to its most abstract end. Acquired by Kimbell Art Foundation, Fort Worth, gift of The Burnett Foundation, 2011.